This project brings together eight partners and musicians of Belgium, France, Luxembourg, Estland, The Netherlands. The philosophy of the project is to promote exchanges between young musicians and structures of these countries. Meet us at one of the upcoming concerts! Each year, Criss Cross Europe brings together 6 promising young jazz and impro musicians from 6 European countries to form a pan-European band. During the residencies these musicians work together, guided by experts and an artistic coach – a flag-bearer of the European jazz scene. The residencies are concluded by a concert tour that takes the band to prominent venues and festivals in – minimum – the 6 countries involved in the project. Throughout the residencies the partners meet to investigate the ingredients that help build international music careers. 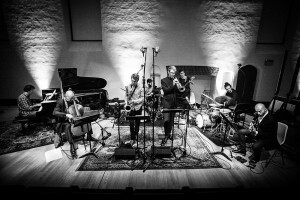 • The residencies serve as a musical laboratory where outstanding young jazz performers get a chance to experiment with their own compositions, improvisations and standards. This artistic process is guided by the artistic coach. This band leader is chosen for his value in a specific field that helped shape the form like Louis Sclavis (F), Marilyn Mazur (DK/PL) or Stefano Bollani (I). Together with the Criss Cross Europe partners he/she selects the young musicians of the band, according to their potential to build an international career. During the residencies there is ample time to form the group’s temperament and to work on their own sound. The result of these efforts takes the band ànd their band leader on a concert tour across excellent venues, taking them Crisscross through Europe. • Musicians grow up in their own surroundings, in music schools and academies that they know well – but going abroad means stepping out of the personal comfort zone. In an international context, musicians are evaluated by standards that can differ greatly from those in their own country. Musicians are invited to reflect on what it is that makes their music interesting and different for an international public and market. • During this project the musicians will find a common musical ground with other musicians and thus creating an open environment for cultural dialogue and inspiration. • The residencies also serve as career/talent development training centres, where each musician gets the chance to fully investigate his employability on a European level. Each Criss Cross Europe partner will make extensive use of the networks in his country to provide the musicians with useful information. The idea of Criss Cross Europe came to life in 2008, then under the name of Jazz Plays Europe (www.jazzplayseurope.eu). The spine of our collaboration, was encouraging interaction between the different jazz scenes, for instance by organizing a yearly laboratory. Each fall we brought together one of the most talented young musicians from each country. An artistic blind date. With the concert program that resulted from this laboratory, the band went on a tour through all participating countries to play in good concert halls and on reputed festivals. The potential of this initiative was enormous: the musicians were challenged to play with musicians they didn’t know, they were obliged to step out of their comfort zone and work in a European context, they were encouraged to meet programmers and professionals in several countries, they had a chance to play on high level international stages, and much more. In 2012 we celebrated the 5th anniversary of the network with a concert evening at Flagey in Brussels. Things became more ambitious and we decided to change the name to Criss Cross Europe. Some partners left the network, others joined in and we came to a steady base of six European partners, geographically spread throughout Europe. From 2015 on we started working with an artistic coach and band leader (Ernst Reijseger in 2015, Louis Sclavis in 2016) and we started adding professional advice and formation for the young musicians. The laboratory concept has proven to be fruitful and creative for young artists on a European level. Several of the musicians that participated in Criss Cross Europe have become established names in the European jazz scene in only a few years: Lander Gyselinck (B), Mattias De Craene (B), Piotr Damasiewicz (PL), Oliver Maes (D), to name but a few. Others have continued to play with Criss Cross Europe band members after the tour was over or invited them to become members of their own groups. Many have returned to the venues where they played with the Criss Cross Europe Band.